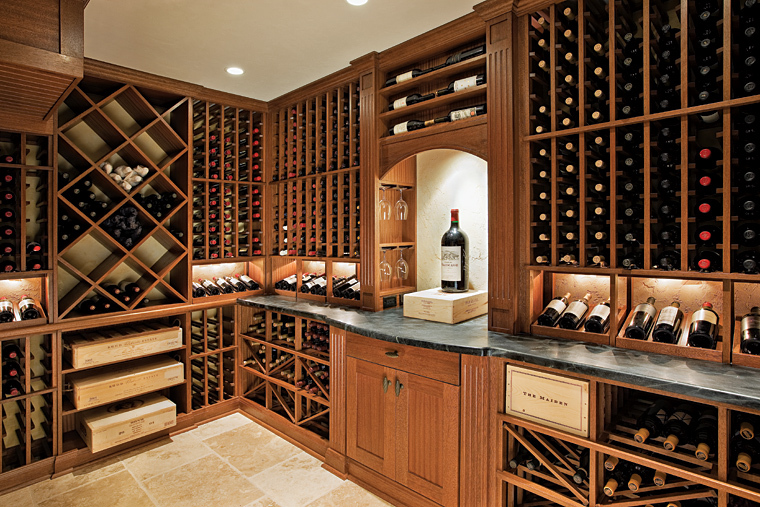 While wine storage can be simple wooden racks in a cabinet, true cellar storage is climate-controlled. Keeping wine bottles at a consistent temperature and humidity allows the wine to age properly and keeps the corks from drying out. Undercabinet or freestanding refrigerators have surged in popularity in recent years with homeowners often including them in renovations. Custom wine cellars, however, are typically only seen in luxury homes with sizes ranging from a small cabinet under a staircase to a large, walk-in wine room dripping with custom wine racks and cabinetry. Custom wine cellars usually start at $20,000, and because it is such a high price point, most homeowners who install a cellar can afford to use the high-end finishes that really add to the ambiance. Wood remains the finish of choice, usually medium to dark in color, accented with stone elements. Wood gives off that warm, rich feeling and is evocative of the barrels in a wine cave. There are so many possibilities for wine cellars, and the only constraints are space and, of course, budget. I enjoyed looking at some of the examples shown on AGBeat. I particularly like cellars that have areas and furniture for gathering. I imagine that a wine cellar would be a great place to relax with a glass of wine or entertain guests, and the addition of fabric or leather on seating pieces helps to soften the hard surfaces in the room. I feel the most successful wine cellar designs are those that incorporate adequate general lighting and attractive accent lighting. With such heavy finishes it is important that the lighting helps to brighten and visually enlarge the space. 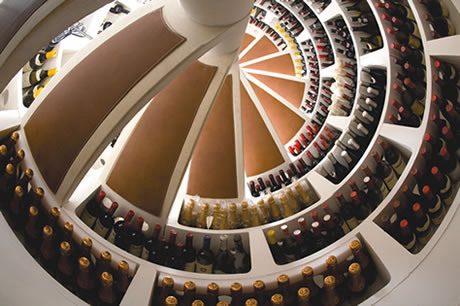 One really cool kind of cellar is a pre-cast spiral staircase from Spiral Cellars out of the UK that is sunk into the floor, and it holds wine bottles all around the sides of the staircase. It is accessible via a trap door in the floor above! The trap door can be finished with the adjacent floor finish, or it can even be clear glass. I suppose some people want direct access to their cellar without have to take the extra steps of walking down and through a basement to get to the cellar. 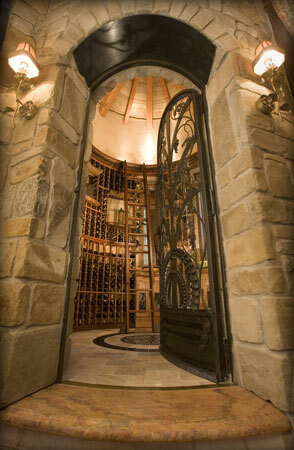 This entry was posted in Design Examples and tagged wine cabinet, wine cellars. Bookmark the permalink.